In my daily work on and in Credo, I often am asked who the “best (SEO/content/marketing) agency” is. I have literally heard those exact words hundreds of times in the last two years. We all want “the best”. We are all addicted to quick answers and quick solutions. The world has trained us to think that there is one “right” solution, and usually a quick one, to many of our problems. Hungry? Load up Seamless and within an hour you have fresh and delicious food being delivered to your door. Your dog barks at the delivery guy, you’ve tipped through the app, and still you complain that it took so long. We want it faster. Need a ride home? Instead of calling up a friend asking for a ride, just load up your Lyft or Uber app and get one. They arrive in 3-5 minutes and take you right where you want to go. And then we complain when traffic is heavy. This mindset carries over to digital marketing consulting. In his book Zero to One, Peter Thiel (cofounder of PayPal and Palantir and early Facebook investor) talks about how he likes to ask potential hires what something is that they believe that almost no one else does. There is no best marketing agency. Yeah it’s myopic and specific to the industry in which I work, but it’s something I hold to dearly and the whole reason for why I’ve built Credo the way I have. When someone asks me who the best agency is, I know a few things about them. First, I know that they are probably not going to sign with a high quality agency because there is more education to be done. Second, I know that they are price shopping. After the question about “the best agency”, I know there will be vagueness around their budget. Usually it’s something like “well we want to get the best price for the best agency”. They may have budget, but they’re trying to negotiate hard and be coy. They’re playing power games. Starting to see the problem here? The “best agency” for whom? The “best price” for what kinds of services delivered by whom? This is why I believe that there is no best agency. Instead, you need to ask “who is the best agency for my type of business?” which is only asked after you determine what your business’s specific needs and budget are. The best agency for who? 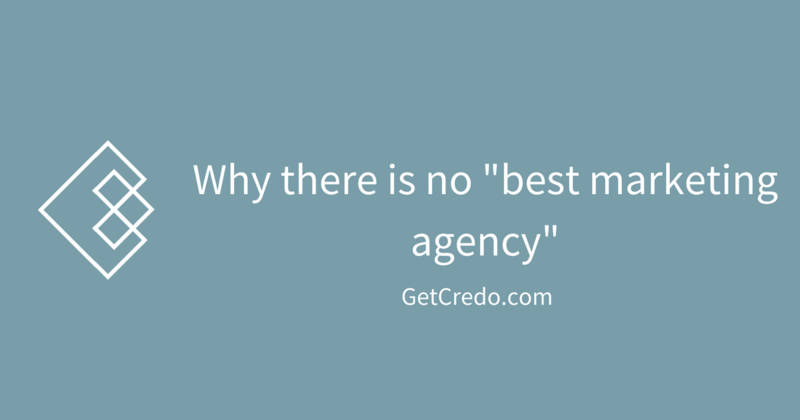 I speak with agencies all the time and ask them what they need, and they tell me that they want “the best agency”. That’s totally fair on one hand, because who wants to hire “the second best agency” or “a decent agency”? As a founder, I want the best for my company. I don’t want the second best person or the second best marketing, I want the best. But I want the best for my business, not someone else’s business. That is the key here. I appreciate the attitude of wanting the best, but I think we need to take it further and ask deeper questions about what makes something the best and recognize that (in the digital marketing world) one agency that is the best for one type of business is not the best for a completely different type of business. When you are assessing the right (aka “best”) agency to hire to do something for you, you need to ask all of these questions. In fact, these are the questions we use in our process (more here) of helping you determine who to have conversations with via Credo. Do you already have a strategy in place, or do you need the agency to do that? Do you have a team in place, or will you need the agency to also deliver on strategies? Is your project self-contained into an audit, or do you need ongoing support? Do you have a subject matter expert internally, or are you relying on your provider to be that expert? What are your expectations for what you can get for that budget? All of these need to be thought and sometimes coached through in order to find the right agency for your business and needs. The best price for what? As mentioned above, mentions of “the best agency” often are followed directly by “for the best price”. Well, the best price for what? For a strategy? For a long term engagement? It should be a given that you don’t want to get ripped off. You shouldn’t pay more than the market price for the same type of work. But that’s also a false dichotomy because every project and business and potential agency/consultant is different. So what you pay needs to take these into account. If you want to get “the best price” for “SEO services”, then you’ll likely just end up hiring the cheapest generic “SEO agency” you can find, and then in 4-6 months you will have seen no results and will fire them, only to hire the next cheapest because you are now anchored on a certain price. In reality, you never should have been anchored that low. Instead of saying you want “the best price”, let me help you figure out how to think about pricing. Every business has a P&L statement, whether you know it or not. Your business makes a certain amount of money (profit) and it spends a certain amount of money (loss), and from that you have revenue left over that you can spend. If your business makes $100,000 a month and spends $98,000 of that already, you have $2,000 to spend on marketing. If you only spend $75,000 a month, then you have $25,000 left to spend. You might not spend all of that on marketing (though maybe you should). The point is that a business that has $2,000 to spend on marketing is going to be able to afford way less than someone who has $25,000 a month to spend on marketing. The $2,000 a month spend is also going to grow much slower than the $25,000 a month spend. I think people are afraid of being taken for a ride. They think that if they say they have $25,000 to spend on marketing, then anyone they speak with about their project who knows that will automatically try to charge them that. I don’t believe this is true when working with ethical providers. When you are looking for a marketing partner (or any kind of partner really) you need to figure out if they are trustworthy or not. You should have discussions with multiple partners to understand pricing differences. You should learn why Agency A charges more than Agency B. And then you need to have conversations with multiple providers to understand their capabilities, how they’d approach your project, if you like them and trust them, and what amount of risk you are willing to take on. This is what we do here at Credo. If you want our help with putting together the right project for your business and goals, we can help you out with that using the Porter Service. If you have all of this figured out and want some recommendations of and introductions to agencies that you should speak and work with, then you can do that here. Are you a busy executive or marketer looking to hire the right marketing provider? Download our free PDF guide before you do. It is meant specifically for the busy professional like you. I am the founder of Credo. I have 10 years of SEO and digital experience, across agencies and in-house, and have worked with some of the largest websites on the internet to drive growth. I live in Denver CO with my wife and dog. I am an entrepreneur, speaker, writer, skier, rock climber, and plan to visit every continent on Earth. You can find me on Twitter and LinkedIn. Credo helps businesses like yours find the right marketing provider to work with. We get to know you and your business, then connect you with the right providers based on your needs. We then walk with you through the whole process of choosing the right provider.